MachSol Forum Shifts to Blogging! MachSol Forum has successfully been replaced by MachSol Blog. All posts, news, event announcements and press release information has been moved to this official blog. Existing & New Visitors: We have made it more easy for you to participate and communicate with us via this blog by removing the hassles of registering an account. 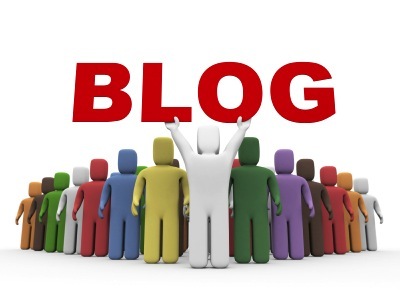 Now, you can use this blog just similar to your valuable presence at our retired forum. Here you can not only write your precious comments on various categories of postings but you can also learn about new offers, announcements, updates, tips & tricks etc. Posted in Announcements, Company | Comments Off on MachSol Forum Shifts to Blogging! 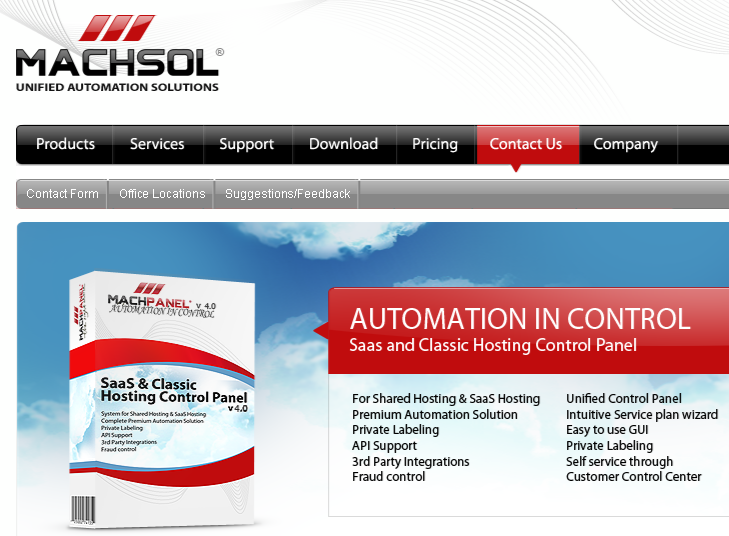 Yorba Linda, California – April 9, 2010 – MachSol Inc. (www.machsol.com) developer of MachPanel an emerging leader of SaaS enabled Hosted Services Delivery Platform is glad to announce the launch of its brand new customer focused website, this April. With a fresh new look and cool theme, the new site, (http://www.machsol.com) is much more interactive and user friendly that poses better user experience with effective navigation giving a much improved and professional look. It provides a more comprehensive source of company information and services. Now you can also read the latest press releases, view online demos, check out product news/updates, and learn about FAQ’s, request call back, access important links and much more. Latest site has been designed, keeping in mind the customer responses and research; what our customers want? MachPanel v.4.1 BUILD 16, Now Available! We at MachSol Inc, are pleased to announce the immediate availability of latest build of MachPanel Provisioning System – Complete SaaS & Traditional Hosting Windows Control Panel. Latest build MachPanel v.4.1 Build 16 mainly addresses bug fixes alongside performance improvements and new features including Smarter Mail 6 Support. Posted in Announcements | Comments Off on MachPanel v.4.1 BUILD 16, Now Available! Yorba Linda, California – March 17, 2010 – MachSol Inc. ( www.machsol.com ) developer of MachPanel an emerging leader of SaaS enabled Hosted Services Delivery Platform, believes in outperforming our customer’s expectations by continuously adding new and advanced features and further improving control panel’s performance by developing new builds and releases. 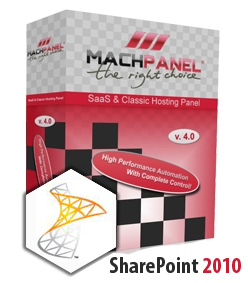 We are glad to announce the release of our New Build “MachPanel v.4.1.15” unveiling complete support for SharePoint 2010 (Beta). Latest release also addresses bug fixes alongside performance improvements. Please consult Release Notes for details. MachPanel v.4.1 BUILD 14, Now Available! We at MachSol Inc, are pleased to announce the immediate availability of latest build of MachPanel Provisioning System – Complete SaaS & Traditional Hosting Windows Control Panel. 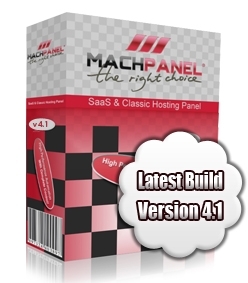 Latest build MachPanel v.4.1 Build 14 mainly addresses bug fixes alongside performance improvements and new features. Posted in Hosting & SaaS, Microsoft SharePoint | Comments Off on MachPanel v.4.1 BUILD 14, Now Available! Add Sub area and set the appropriate Url, like following……. 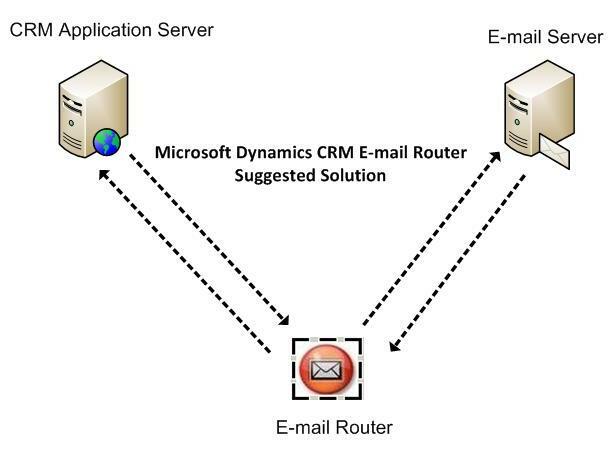 Install the e-mail router on a dedicated machine and Configure all users in CRM to use the E-mail Router for both incoming and outgoing e-mailConfigure the “info” CRM queue to also use the E-mail Router for both incoming and outgoing e-mail. MachPanel v.4.1 BUILD 13, Now Available! At MachSol Inc, we value our customers and keep on contributing to their business success by continually improving the MachPanel Provisioning System through introduction of new builds and releases. We are writing here to alert you about the immediate availability of MachPanel v.4.1 Build 13 which mainly addresses bug fixes alongside performance improvements and new features. Posted in Announcements | Comments Off on MachPanel v.4.1 BUILD 13, Now Available! 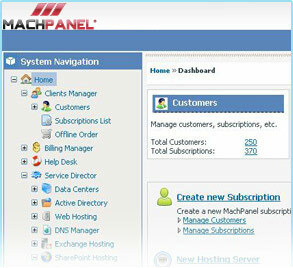 Yorba Linda, California – February 18, 2010 – MachSol Inc. the developer of MachPanel an emerging leader of SaaS enabled Hosted Services Delivery Platform, appreciates its customers for showing faith in us and making us the premium Hosting Control Panel. In our continuous endeavor for giving our clients the best, we are glad to announce that our new build is available, through which we become one of the first Control Panel supporting Exchange 2010.